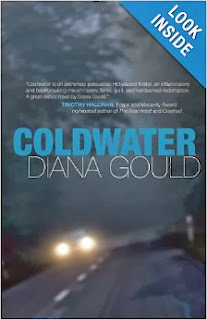 Coldwater is a dark thriller that begins with a coke and alcohol addicted writer of a successful detective television series committing vehicular homicide and leaving the scene of the accident. This is the catalyst of Brett Tanager’s spectacular spiraling downfall from the heights of the Hollywood elite to the depths of despair, guilt and loss. Gould’s portrayal of Tanager as an addict plunging to her bottom is stark and realistic. It is clear that Gould has seen closely the effects of addiction and the torment of a tortured soul. Even within the depths of her degradation, Tanager finds herself drawn into an investigation into the disappearance of a privileged teen, the daughter of a Hollywood mover & shaker and her former step daughter’s best friend. This novel has it all – the glitz and glamour as well as the dirty underbelly of the entertainment industry. Coldwater is a great, page-turning read that calls to mind Elmore Leonard and the earlier books of James Patterson.